• Part I sets out a general methodology for constructing legal arguments. • Part II focuses more closely on the construction of persuasive, well-grounded legal premises, and covers the effective integration of legal doctrine and evidence into the argument's structure. • Part III shows how to put the method to work by giving two detailed examples of the construction of complete legal arguments from scratch. • Part IV provides a detailed protocol for reducing well-constructed legal arguments to written form, along with a concrete illustration of that process. It also provides concrete advice on how to recognize and avoid a host of common mistakes in the written presentation of legal arguments. • Part V moves from the basics into more advanced techniques of persuasive legal argument. 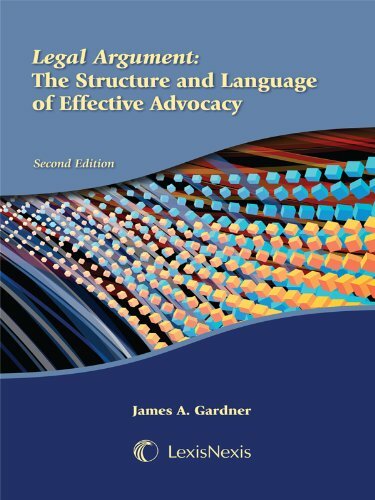 These include rhetorical tactics of framing and emphasis, how to respond to arguments, maintaining professionalism in advocacy, and the ethical limits of argument. If you have any questions about this product by Brand: LEXISNEXIS, contact us by completing and submitting the form below. If you are looking for a specif part number, please include it with your message.